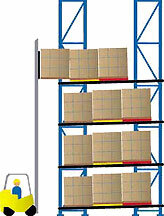 Push back rack operates through a system of carts that ride on rails in the pallet rack. Each set of rails has an incline through which gravity “pushes” all pallets toward the front of the rack. The carts fit atop one another when the bay is empty, and as pallets are placed on carts, previously loaded carts are “pushed back” by each added pallet, hence the name for this rack system. 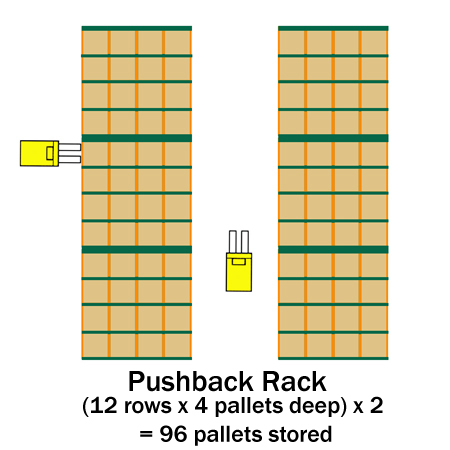 Push back rack is a last-in first-out system that reduces pick time because all pick faces are at the front of the pallet rack. While there are many benefits in using Push back rack, there are also some limitations. So, how do you retain the benefits of pushback, but reduce its limitations? A new innovation in pallet handling helps you reduce limitations – it reclaims lost vertical space and allows deeper storage in the lane. 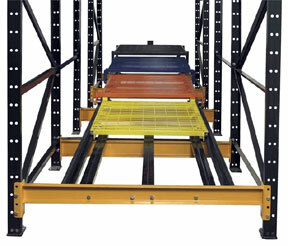 It also removes the need for special flow carts, and retrofitting existing rack is quick and relatively easy. 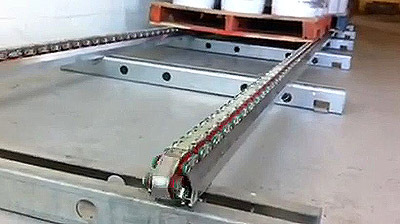 Flow Rail is a chain driven, non-powered pallet flow system that like push back and drive-in rack is a last-in first-out system. The benefit of flow rail is that it requires no incline, thereby recapturing that vertical space used by push back and gravity flow rack. Additionally, there are no carts to contend with – just position the pallet at the front end of the rack and push backward. All pallets in the lane will move backward as well. To unload, engage the pallet with the forklift forks, tipping them down somewhat so that only the front end of the pallet is lifted and drag the pallet out of the rack. As the pallet moves out, it engages the chain cleats, initiating forward movement of the chain, and causes all the other pallets in the lane to move forward as well. This simple solution requires little to no maintenance and may work with your existing pallet rack. 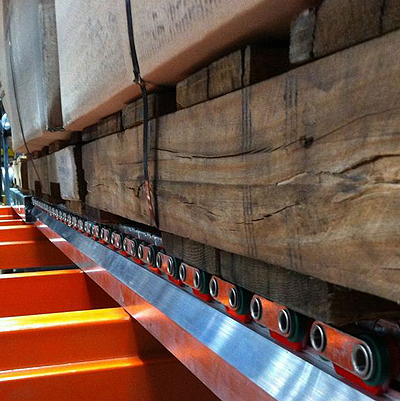 Retrofitting involves moving all beams to a level plane, adding the flow rail track with chain, and reloading the racks with product. In some installations, additional cross supports may be needed depending on the weight of the pallets. Another great benefit is that you can go up to 10 pallets deep. A little reconfiguration and you’ve got deeper lanes, freeing up more floor space for other uses. As your company grows and more SKU’s are added or more inventory must be kept on hand, your existing pushback rack may not offer the capacity you need. A classic example: Storage facility with two sections of pushback rack storing 4 pallets deep x 12 rows = 96 pallets stored. 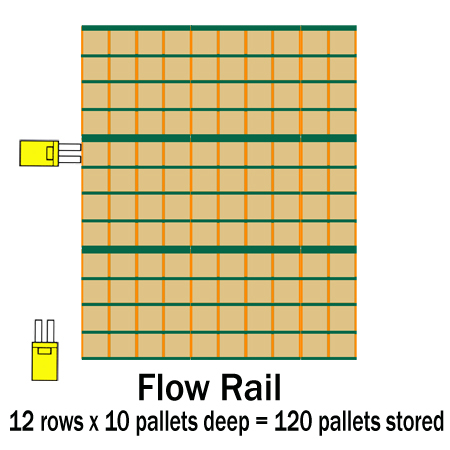 In the same square footage, flow rail gives you 10 pallets deep x 12 rows which = 120 pallets stored. You gain 24 more pallet slots for every level of storage in your facility. That adds up to significant space savings quickly. It’s that extra pallet depth that allows flow rail to offer extra capacity in the same square footage. Now, consider the vertical space you can recoup by eliminating that incline. It is possible to regain an additional level, depending on how high your current pushback rack is and how much clear ceiling height you have available. Deeper lane capacity, more efficient use of vertical space and retrofit options rather than completely scrapping your existing rack and starting over. Consider flow rail when storage space gets tight rather than looking at building or moving to new storage space. This article is part of a series of articles on Flow Rail. Click on a link below to view one of the other articles.